Police and intelligence officials said they are investigating the credibility of the informant and are concerned that al Qaeda operatives may be mounting a disinformation campaign to divert and weaken European counterterrorism efforts. Before the informant's tip, German officials had played down similar tips supplied by two men arrested this year in Pakistan and Afghanistan. Those reports led the U.S. and others in October to issue warnings of possible attacks in some European cities—to the frustration of German officials, who declined to change their own security posture, arguing the intelligence was inadequate. A spokesman for the German Interior Ministry declined to comment on details of the investigation, and said nothing has changed since Germany warned of a possible terrorist attack in mid-November. 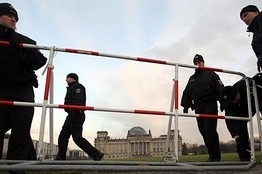 The warning was based on a recommendation made jointly by all of Germany's security services, the spokesman said.